Готовлю-подготавливаю своих зябликов к страноведческому конкурсу. Наклепала упражнений по теме СОЕДИНЕННЫЕ ШТАТЫ АМЕРИКИ. Быть может, пригодятся. Упражнения для 5-6 классов. Упражнение 1. Read the text. Find all the geographical names in bold on the first map (Map 1) and complete your own map (Map 2). New words: border on, gulf, consist of, separate. The United States of America is also called the USA, US, United States or sometimes America. 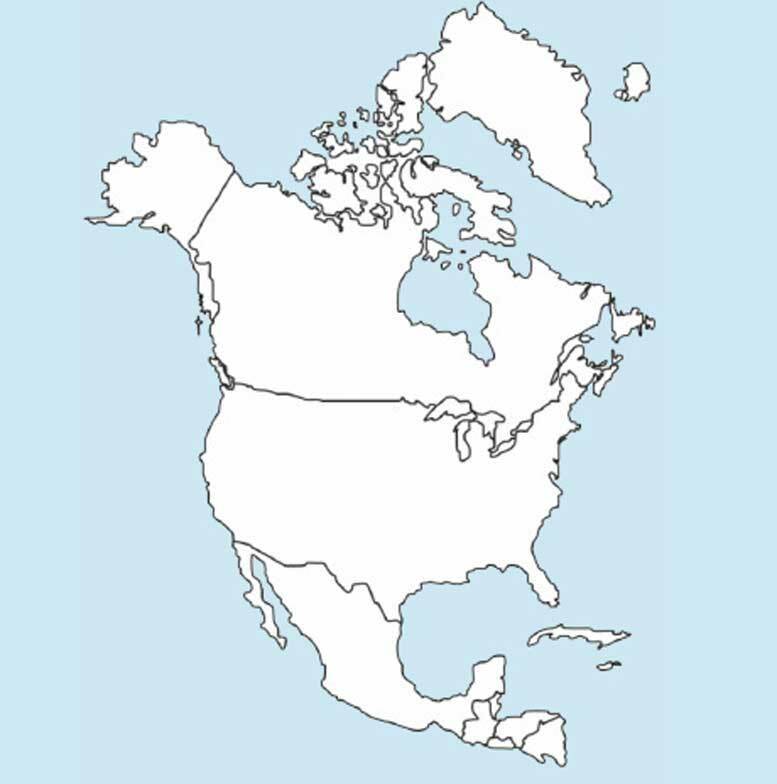 The USA is in the central part of North America. It borders on Canada and Mexico. It is washed by the Atlantic Ocean, by the Pacific Ocean and by the Gulf of Mexico. The capital of the USA is Washington. The area of the country is about 9,400,000 km2. Its population is about 324 million people. The US is the 4th largest country in the world by land area and 3rd by population. The Great Lakes are in the north-east of the country. They are Lake Ontario, Lake Huron, Lake Erie, Lake Superior, Lake Michigan. The largest rivers of the USA are the Mississippi and the Missouri. Упражнение 2. 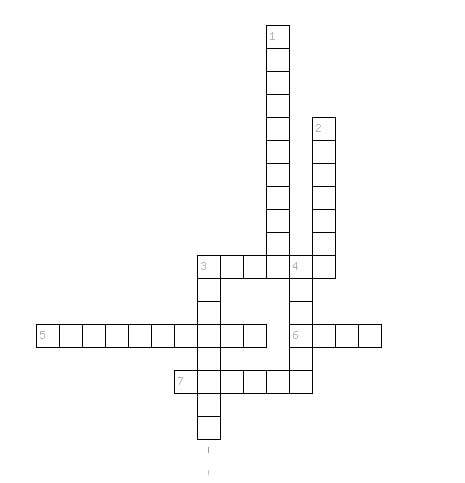 Do a crossword. 1/ The longest river in the USA. 2/ One of the largest city in the USA. 3/ The USA borders on it in the South. 4/ The USA borders on it in the North. 3/ The highest mountain in the USA. 5/ The ___________ of the country is about 324 million people. 6/ The ___________ of the country is about 9,400,000 km2. 7/ The most northern state of the USA. Which are the highest mountain ranges? Where are the Great Lakes situated? Which are the largest rivers? The most populated city in the US is NYC, isn’t it? THE USA. States and symbols. Упражнение 4. Read the text. Find the 5 largest states on MAP 1. What are their capital cities? The USA is a federal republic. It consists of 50 states. The five biggest states are: Alaska, Texas, California, Montana and New Mexico. The capital city – Washington – is situated in a special district — the District of Columbia. One of the national symbols of the country is the flag. It is also called STARS AND STRIPES. There are 50 stars on the flag – one for each state. There are also 13 stripes. The 13 stripes represent the 13 original colonies of the US. The national bird of the USA is the Bald Eagle. The National mammal is the bison – just like in Belarus. The national flower is the rose like in England, and the national tree is an oak. How is the national US flag called? What do the 50 stars on the flag stand for? What do the 13 stripes stand for? What does the USA have in common with Belarus and with England? 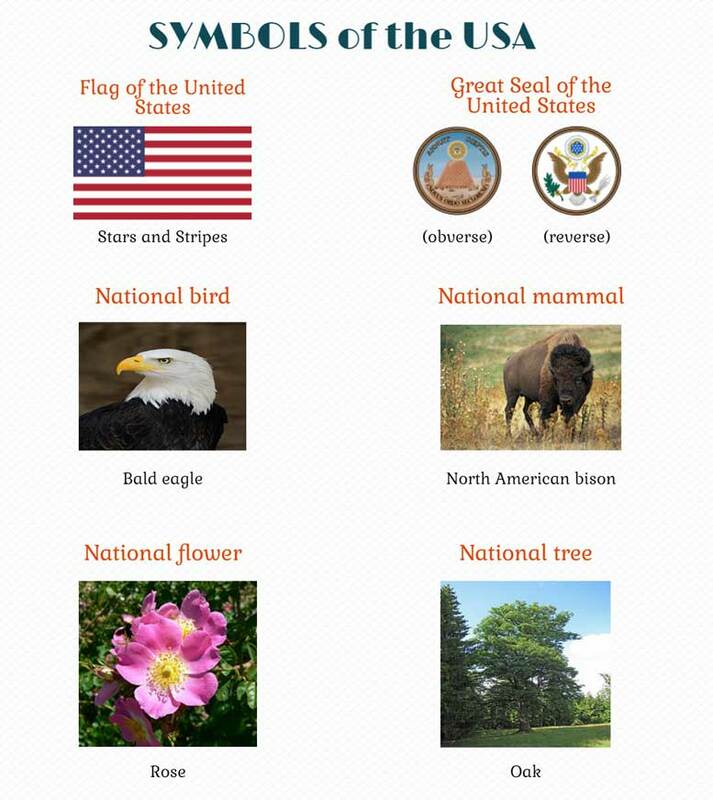 What is the national tree of the USA? What is the national bird of the USA? Упражнение 6. Read the passage and complete the table. The first is done for you. Have parties, go to clubs, meet their friends, greet the New Year in. New Year's Day, January, 1st. People stay awake until after midnight on December 31st. They have parties, go to night clubs, meet their friends. Many people greet the New Year in. Valentine's Day is not a national holiday. Banks and offices do not close, but many people celebrate Valentine's Day. They exchange cards and spend their time together with the loved ones. George Washington's Birthday is not a national holiday. It's a great day for shoppers. Many shops have sales marked by unusual bargains. People usually go shopping on this day. People celebrate Easter on the first Sunday after the first full moon between March, 22, and April, 25. Pupils usually have spring vacation at this time. Easter is a church holiday, and many people go to churches on this day. People give each other eggs. Memorial Day is a national holiday. Schools, banks and offices close for the day. On that day, Americans honor the soldiers who gave their lives in past wars. Schools, clubs and churches decorate the cemeteries. They put up the flags on the graves of the army, navy and airmen. Independence Day is a national public holiday. On this day, in 1776, America signed the Declaration of Independence. People have picnics and parties and meet their friends on this day. On this day Americans just have a nice holiday. It is not a national holiday. Children dress up as ghosts and witches and go out into the streets to beg. They go from house to house and say: «Trick or treat!». In the USA Thanksgiving Day is a national holiday. All members of the family gather at the house of their parents. The family has a large traditional dinner, usually with turkey, cranberry sauce and pumpkin pie. It is usually a one-day official holiday. Christmas is a family holiday. Schools and colleges close between Christmas and New-Year's Day. People stay at home and spend the time with their families. Вам также полезно будет прочесть текст Thanksgiving Day. Упражнение 7. Do you think this statements are true or false? Correct the false statements. The United States of America is also called the USA or the UK. The capital of the USA is EDINBURG. The Great Lakes are in the north-east of the country. 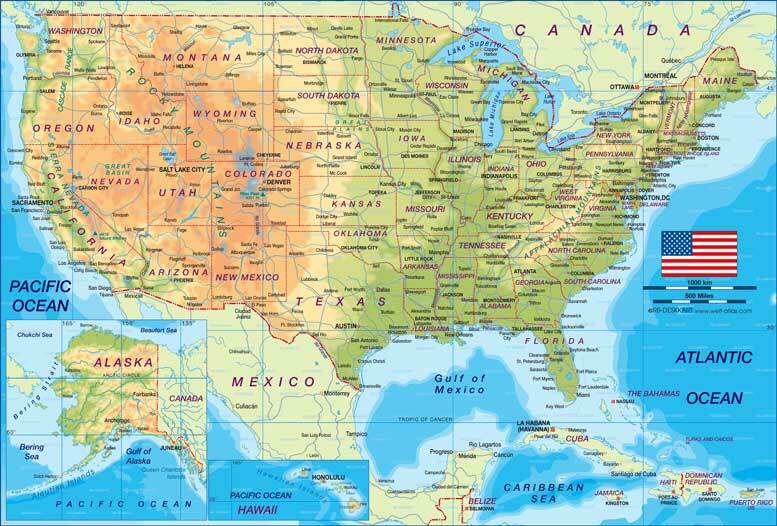 The USA consists of 13 big states and 50 small states. The national flag of the USA is also called UNION JACK. The national bird of the USA is the Bald Eagle. Independence Day is a national public holiday. Alaska was bought from Russia in 1867. Most of the world's tornadoes occur in the USA. The first man to walk on the moon was American George Washington. The most popular sports in the US are American football, baseball and basketball. 7 Комментариев для "Задания по теме США для 5, 6 классов. USA activities"
Замечательный сайт, спасибо огромное от начинающих педагогов!Хотелось бы с Вами сотрудничать в будущем:)) Удачи Вам во всем! Есть одно замечание: на Большой печати США надо поменять местами картинки, т. е. obverse с орлом, reverse с пирамидой. Спасибо, Аркадий, да, что-то я неправильно нарисовала, надо переделать. Постоянно пользуюсь вашим сайтом. Очень нравится,доступная информация.спасибо вам огромное!! !